Ilan felt thirsty at the sight of the tent, she felt thirsty, hungry and tired. Ilan was excited about everything but she was really tired. Still she did a last effort to follow Wajada, the mysterious desert woman. Wajada walked passed the tent, and together they reached the hilltop of the dune where the tent was built and behind it, and downhill, was built a whole village! A center building was built in the center and that building was surrounded by a dozen little cob huts. 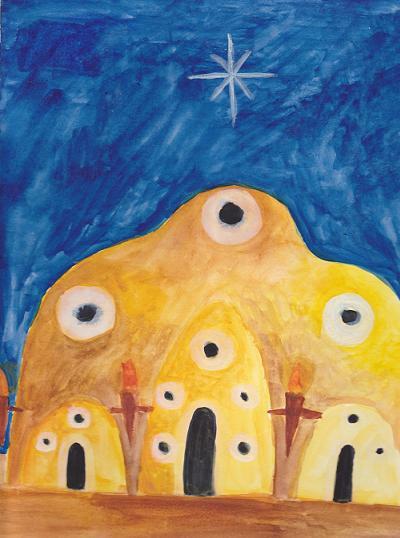 The center dome illuminated the whole village with its torch lights hung on its side walls. “That’s the Council Dome” Wajada said whilst she invited Ilan to walk downhill. Ilan nodded, but she didn’t understand the full meaning of Wajada’s words. She was going to discover it in just a few seconds. She stepped inside and looked around. Nothing but a huge vaulted dome. Only sand. Sand on the floor and on the walls. No furniture of any kind. Only a huge round hall with a fire in the center, and the councellor. Michaela Devi Genaine, Spain michaeladevi@hotmail.com Although I am of Swiss origin, I have been living in Spain for 20 years. I moved to this country with my family when I was 9 years old, and have since then been involved with a broad spectrum of alternative projects, as well as being a pioneer of homeschooling. I am currently living in the Prades mountains near the Mediterranean Coast. I practice sustainable gardening, ecopsycology, art and psychosynthesis. I am fluent in English, Spanish and French. This entry was posted in Past Travellers and tagged Ilan. Bookmark the permalink.